As I write at the breakfast table, my iPhone is in the hands of a Bedouin who is skilled in taking phones apart, cleaning them, and putting them back together again. I’ve been told that he can get anything out of them. My phone has been mangoed. I knew it was going to happen, too. I’d been carrying round a slightly leaky carton of mango juice in my bag for a day and knew it would spill on something. It spilled into a pocket of my bag, into which I unwittingly thrust my phone. Lovely. It carried on working as normal for a few hours so I thought I was in the clear, until it started saying NO SIM and suddenly trying to delete apps without me telling it to. I tried the old ‘bag of rice’ trick overnight to no avail. So this meant that I had a day without my iPhone and it turned out to be blessing. 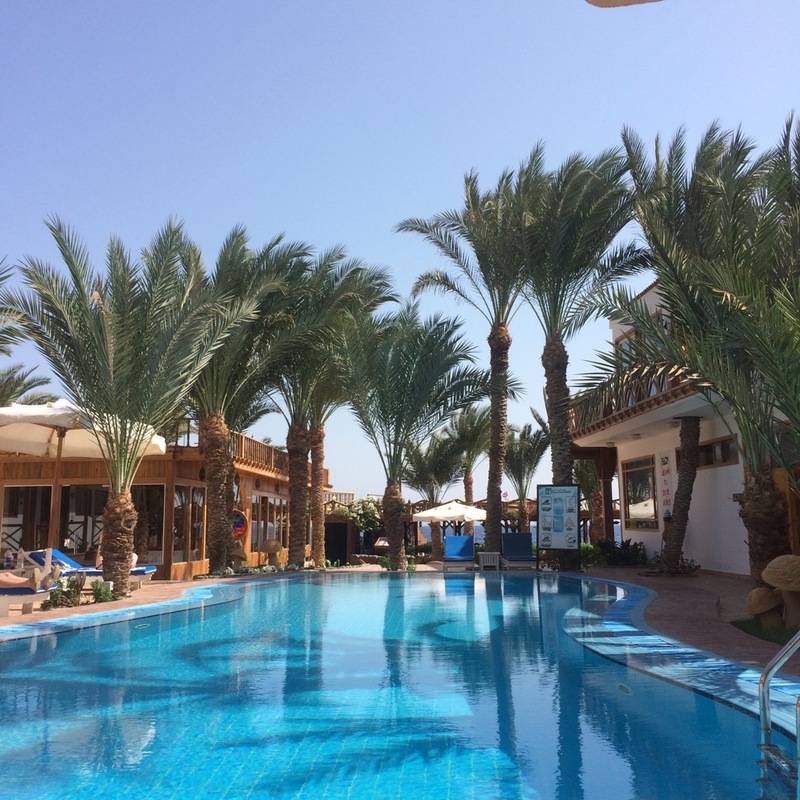 I’ve been spending the last couple of days at the pool of the Acacia Hotel, which is closer to the sea than the one I’m staying in (I checked out one of the rooms – pretty cool – around £30 per night). 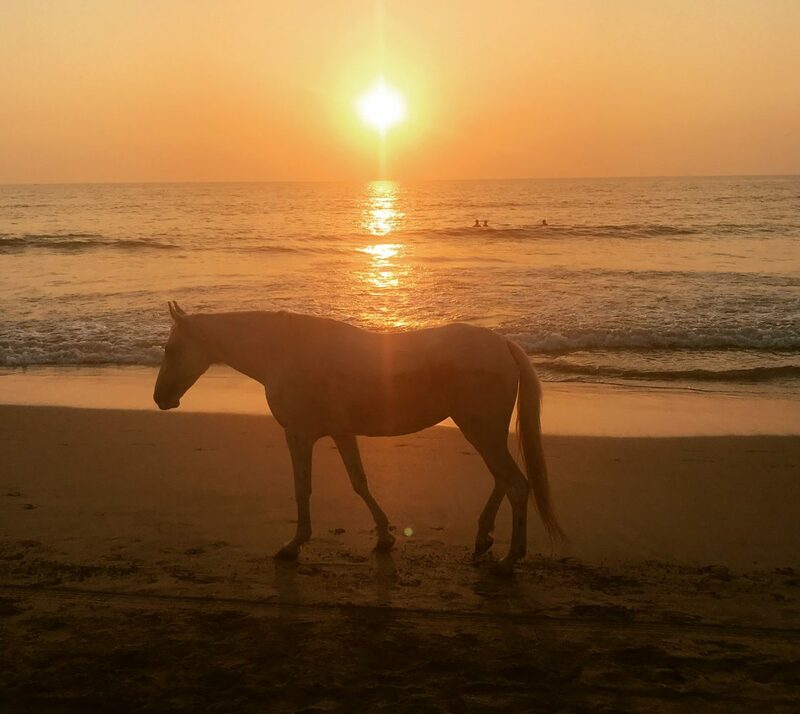 It has a relaxed poolside vibe with some interesting people busying themselves with dive trips, and a gorgeous restaurant overlooking the sea. I’ve just found a spot among the Bedouin cushions and stared at the Gulf across to Saudi Arabia. The view from the restaurant over the Gulf of Aqaba across to Saudi Arabia. As you do. I’ve also been joined by a variety of animals – Bufra’s daughter, Fatty, and a load of cats. NB. Don’t order the tuna salad unless you have a water gun by your side. They appear like something out of Dawn of the Dead. Fatty is sleeping, with the trademark Bufra smile on her face. 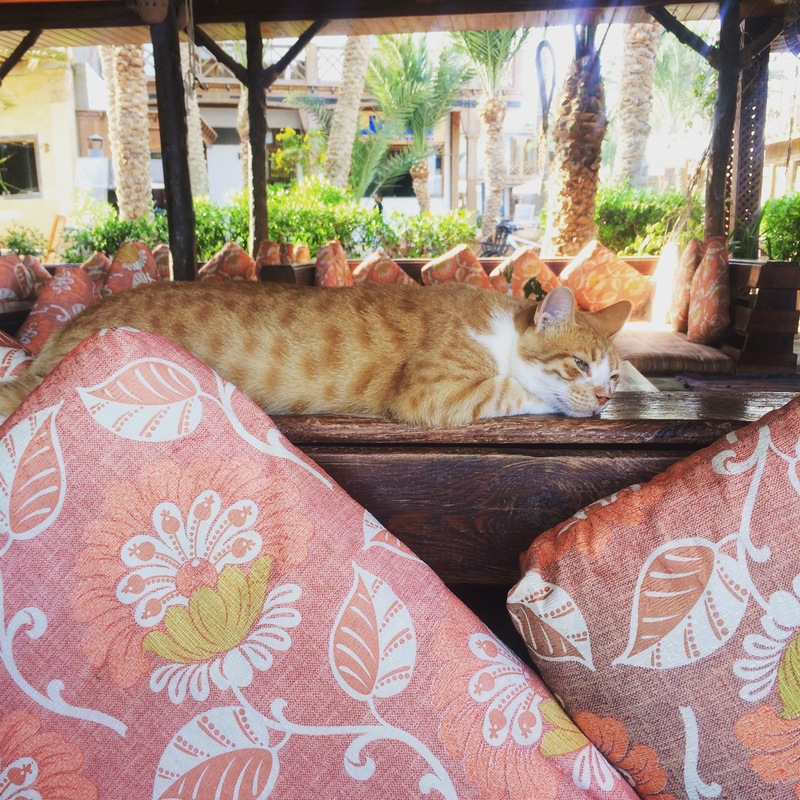 You may have noticed that I’m a tad obsessed with the animals of Dahab, specifically the dogs. 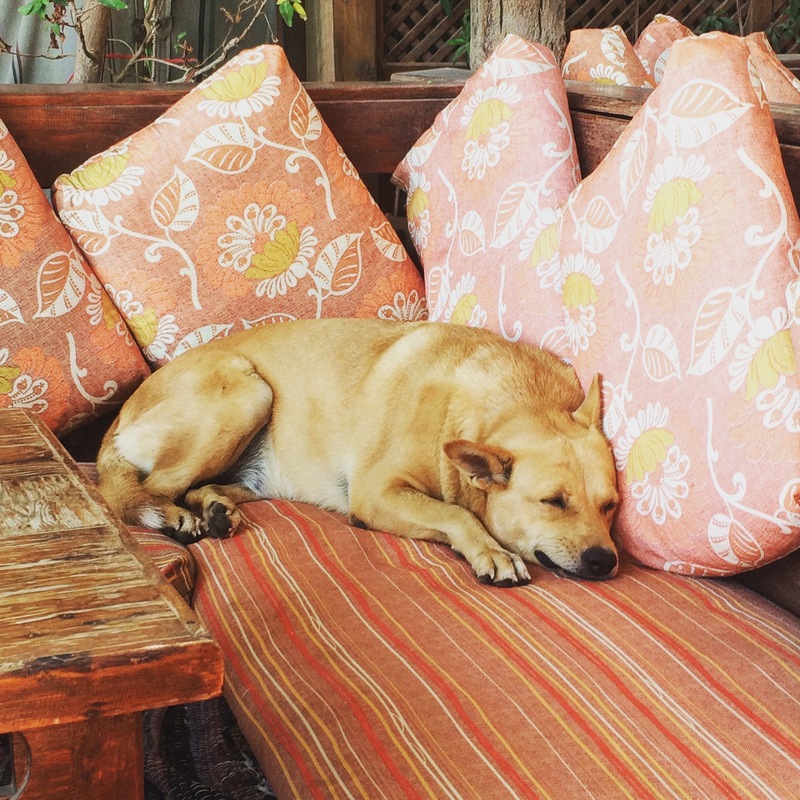 I have a theory that it is the Dogs of Dahab who rule the town, the humans are just incidental. There are street dogs, pet dogs, dogs that run gangs who literally hound each other around town, dogs that smile, dogs that can’t bear it if you stop stroking them, dogs covered in battle scars from a hard life, puppies that pull the hem of your dress. I heard that people often adopt dogs they like to save them from living on the streets. Sniff. Yesterday I met my friend Sara’s little puppy and had a cuddle. I needed it after the iPhone fiasco. Puppy cuddles are the way forward, it seems. And a little retail therapy – I bought a couple of dresses from a guy I know who never hassles me and a bangle from quiet Mohamed Ghareb in the gorgeous Why Not shop (I ‘know’ him via Instagram). If only Egyptians learnt that the way to the tourist dollar is by NOT asking them to come into their shops. I make a point of only shopping in the quiet places. 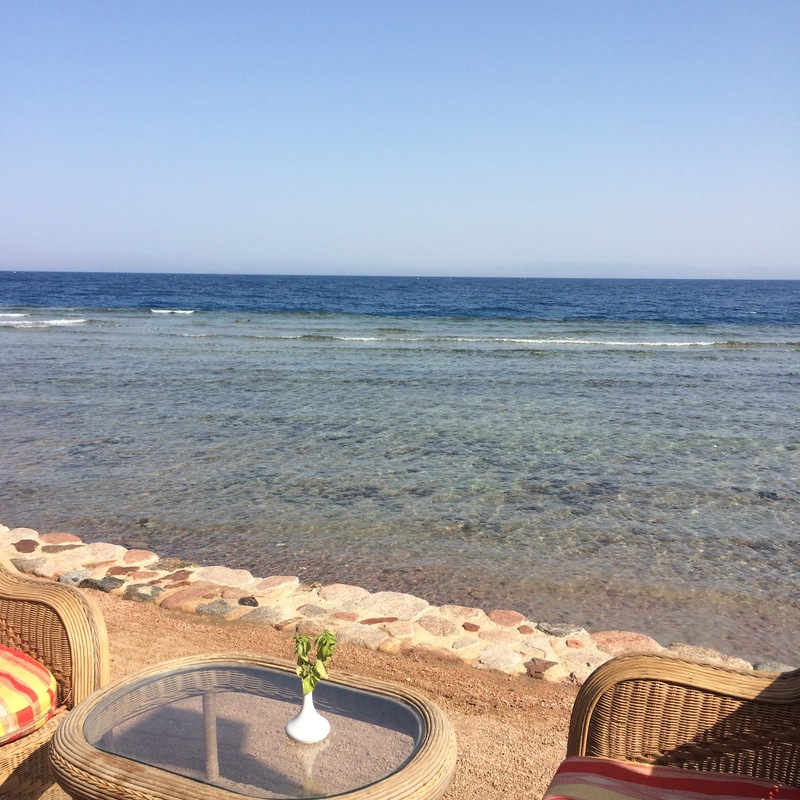 After spending the day watching people prepare snorkelling and diving equipment at the Liquid Dive Centre next to the hotel I realised I must be the only person not doing it in Dahab. I can’t swim. I keep asking around for boat trips I can go on that don’t involve getting in the water. Why do I have to? What happened to just being on a boat? They seem to think it would be boring – not for me. The sea is never boring. If I go on a dive boat I know I’ll be hassled to death, “Just wear a lifejacket! You will love it!” No. No I won’t. I will panic and you will have to save me. I’ll spend the whole time being a dickhead in front of everyone and having to explain myself. I almost feel bullied in these situations, to be honest. 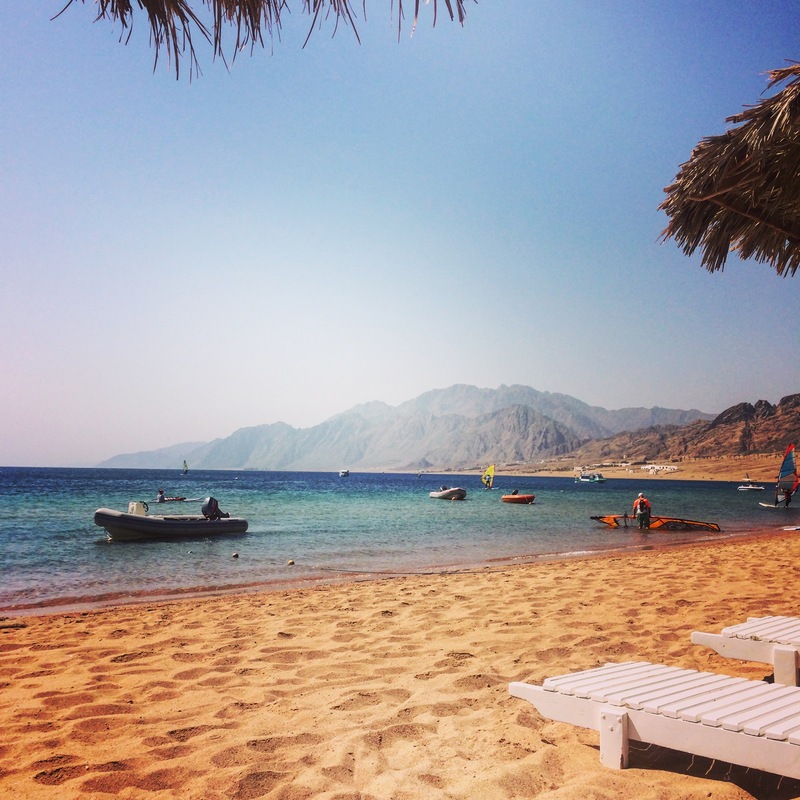 If one thing could improve my Dahab Days, it would be a simple boat trip into the Gulf. Just with my book and some drinks. Surely someone can provide that? Last night consisted of a reunion of sorts – I met up with some of the friends I’ve made during my numerous visits to Dahab. Most or all of them have worked in the restaurants along the main seafront but now one of them has a new job in a new place – Sea House – so we thought we’d meet there. 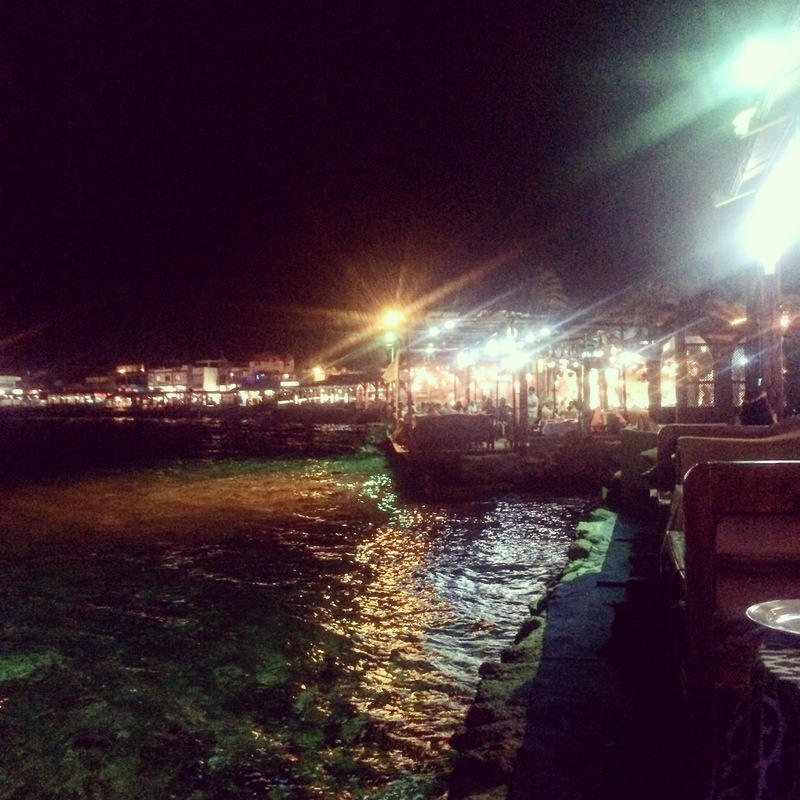 Dahab’s restaurants seen at night from Sea House restaurant. It has tables overhanging the sea and the water is lit so you can see fish in it. As I walked alone from the hotel in Mashraba (south of the bridge) to Masbat (north of the bridge), through the brightly lit shops hung with clothes, lamps, and bits of Egyptian ephemera, I laughed to myself about the first time I came here, in the daytime. I’d got the shuttle bus from a hotel outside town and was scared to death of the place with all its hustle and bustle. Mainly hustle. 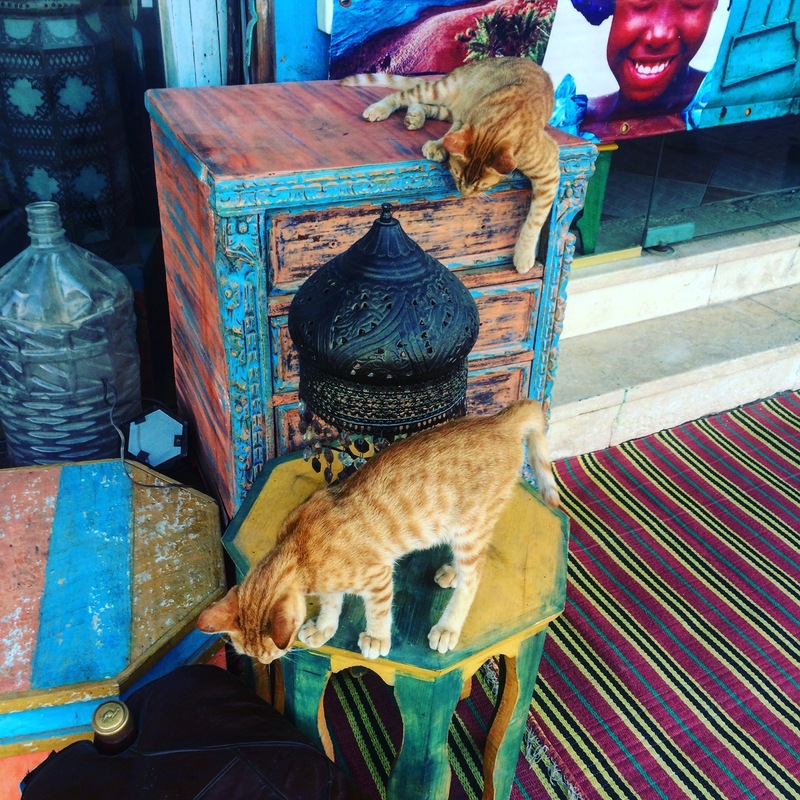 Cats playing outside Why Not – a great little shop in Dahab. Now, I feel no fear whatsoever. In fact, it’s almost gone in reverse. This time, I’d been worried about getting into town via an alley behind the hotel. It snakes behind some housing and a café and brings you out on El Mashraba Street. I was terrified of walking it in the day, never mind in the nighttime but when I asked around everyone seemed astonished that I would be scared of it. “It’s completely safe!” they cried. So I tried it. And it was. This happened on my last visit when I pulled back from a moonlit walk towards the lagoon because it was dark, and ‘you never know who’s out there’. Again, my friend couldn’t believe I was scared. Here, walking around in the dark is just what you do. It’s when it’s coolest, of course. We were joined in the restaurant by one of the guys and his one-year-old son – his wife has just had a baby and he seemed stunned with happiness, repeating “al-hamdulillah” (‘thanks to god’) whenever he was congratulated. Toddler Abdullah was taking it all in his (wobbly) stride and I was incredibly touched to see a group of men compete for Abdullah’s attention, wanting to pick him up, kiss and cuddle him and take him for a walk round the restaurant. It transpired that a few of the guys had stepped in to look after Abdullah while his parents were otherwise occupied – it’s a real ‘framily’ support network down here, especially as nearly everyone is away from home and family. Today I went back to the glorious lagoon beach, a long strand of golden sand that I fell in love with at first sight. I bagged a day pass to use the Swiss Inn Resort (£10) which gives you use of a sunbed, towel, and all the facilities in this lovely hotel. If you want a good all-inclusive, I recommend it, and the Jaz Dahabeya next door. Both good quality, family friendly hotels with the best spots on the lagoon and good food. I met Bob – one of the ‘framily’ who works on the beach – he calls me ‘sister’ now. He looked at my whiter than white skin and told me I should use his failsafe way of getting a tan. Going into the sea, not showering the salt water off, dry out for 15 minutes, then repeat. I fear my Welsh skin would object so I stuck with Factor 50. I spent the day reading the first book in Elena Ferrante’s quartet, My Brilliant Friend. I was initially put off by the cover but I am riveted by the Neapolitan saga. 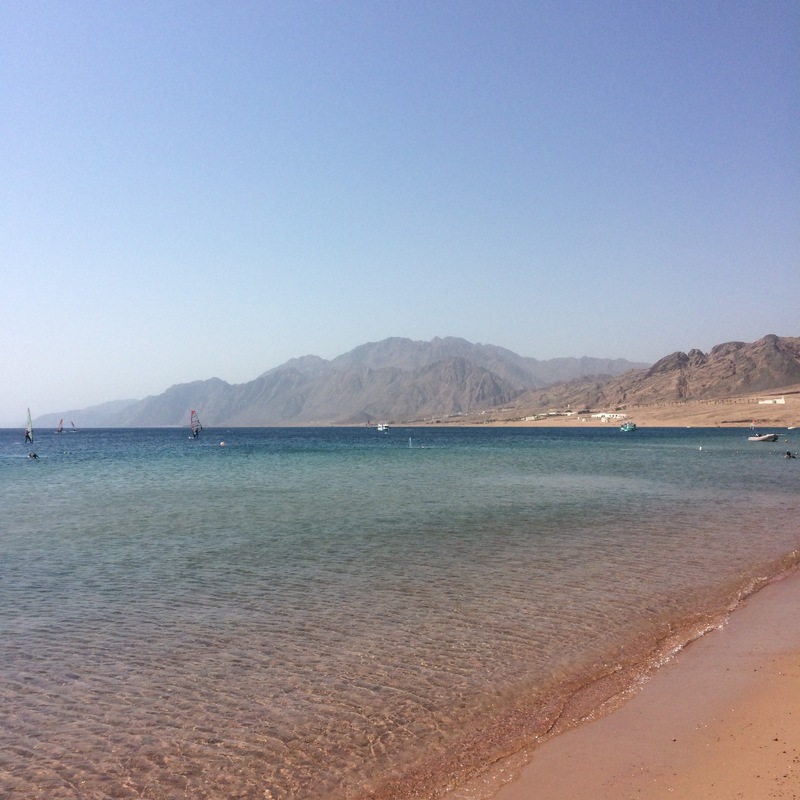 I must be the only person in Dahab who can’t swim so I gingerly walked into the azure water for a quick dip a few times. I generally just sit on the sand (it’s in a shallow bit) and watch the fish swim by me. I get so much pleasure out of this simple act. I’m scared of the water but I’ve managed to find a way to enjoy it that suits me. A slow peeling away of ingrained fears has characterised my visits here, from being too scared to walk in the dark to too scared to go in the water, but I am hopeful that the latter, like the former, will slowly fade away. If ever there was a place to learn to swim, I believe that this is it. In my own piece of paradise.